On Aug. 18, 2004, the German Federal Social Court (Bundessozialgericht ) in a landmark ruling for the first time decided, that a compensation of cancer other than lung cancer is justified for uranium miners. In two cases, filed by former Wismut uranium miners and/or their surviving families, the Court has found that the larynx cancer developed by the miners must be seen as caused by their former occupation and therefore has to be compensated by the employers' liability insurance. The insurance had maintained that no epidemiological evidence had ever proven such causation, while only the dosimetric model by Jacobi (1995) had been used so far to support such claims. The court decisions are relevant for approx. 2000 other former Wismut miners who have contracted cancers other than lung cancer. At the end of the year 2013, Wismut had completed over 80% of its decommissioning task. The decommissioning work is expected to be completed by 2020, while longterm maintenance and surveillance will have to continue for an indefinite period of time. The Federal Republic of Germany, sole owner of Wismut GmbH, has increased the initial Euro 6.65 billion cleanup budget by 5.3% to Euro 7 billion. Of this total amount, Euro 5.4 billion have been spent until end 2010 already. The amount available for the year 2011 is Euro 139 million. The situation at the sites that are no longer under the jurisdiction of Wismut, including a number of uranium mill tailings ponds, is unclear, however. During an inspection in early January 2018, a slump of the cover of the waste rock pile No. 66/207 in Bad Schlema was discovered. A crack with a length of approx. 20 metres had formed in the top cover of the pile, and the cover had moved about 1 metre downhill. According to Wismut's 2013 Environmental Report (p.14), radon concentrations in part of the town of Niederschlema have increased above the 80 Bq/m3 target value as a result of rising radon release rates from reclaimed waste rock piles. The target value includes the background radon concentration and is meant to assure a 1 mSv/a dose limit for the public. The increase of the release rates from the reclaimed piles has been observed over several consecutive years already. The report offers no discussion nor any proposals for remedies of the situation. According to a conference paper presented by the Saxon State Office for Environment, Agriculture and Geology (LfULG) on Sep. 22, 2014, the doses actually reach 3 - 5 mSv/a in certain local areas. An effluent treatment plant is under construction for seepage catched at Wismut's No. 371 waste rock pile at Hartenstein in the Aue area. While seepage at other waste rock piles is allowed to flow into former underground mines located beneath the piles, there exist no such mines at this site: therefore, seepage could reach the Zwickauer Mulde river, if untreated. The No. 371 pile covers an area of more than 65 hectares. The average amount of seepage collected is 37 cubic metres per hour, while the plant can handle 100 cubic metres per hour. On Dec. 2, 2008, Wismut GmbH announced that the reclamation of the Dänkritz I uranium mill tailings deposit in Saxony is almost completed. On Nov. 17, 2008, Wismut GmbH announced that the reclamation of the former Crossen uranium mill site in Saxony has been completed. Demolition of the buildings on the 17 hectare site had started in 1992. All waste material was dumped on the Helmsdorf tailings deposit. The relocation of the 3.2 million m3 Crossen waste rock pile to the Helmsdorf tailings deposit is still ongoing, with completion expected by 2012. "In summary, the exposure of German tailings facilities to earthquakes is low, especially because of the effective standards and regulations which are used to operate them. However, a collapse of a tailings dam could lead to a wide range of loss-scenarios. Overall, the main earthquake-triggered collapses of dams are breaches and liquefactions. These loss-scenarios could lead to severe local and regional environmental damage and contamination, also leading to high economic losses with high costs for down time and compensation." At the end of 2018, the groundwater level in the abandoned underground mine cavity at the Ronneburg site reached the medium-term target level of 247 m above sea level. In the future, the water level will be stabilized at this value by pumping out any excess amounts of groundwater flowing in. The collection takes place via an underground water collection system and a well located in the Gessental valley and directly connected to the mine cavity. The water level is thus kept as far as possible at a largely uniform level. Impairments of the environment through uncontrolled leaks of groundwater are thus avoided. On April 29, 2016, Wismut announced that it has begun to install wicks reaching from the intermediate cover of the Culmitzsch A tailings dam up to 30 m down into the tailings. The process is meant to dewater the tailings in order to increase the stability of the tailings for they can support a final cover. The total length of the wicks will be 900 km. The process will take several years. In a recent update to its reclamation program, Wismut announced on Feb. 26, 2016, that its reclamation task will continue until 2028, when the reclamation of the 90 million t Culmitzsch tailings pile in Thuringia will be completed. On Feb. 9, 2015, Wismut announced that it has obtained the licence for the construction of a 17.3 hectare test plot for the final cover of the 90 million tonne Culmitzsch uranium mill tailings deposit in Thuringia. Wismut had filed the application for the whole area of 241 hectares in December 2012. 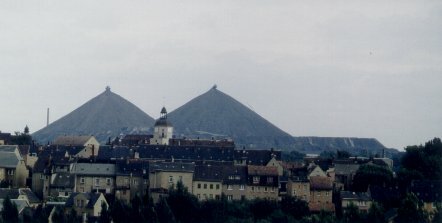 The licence issued by the state mining office (Landesbergamt) in Gera requires a thicker and more expensive cover than Wismut had applied for. Construction is planned to start this spring. "It is concluded that the content in Cd/As, Cd, and Cu exclude herbage/Ronneburg soil from the commercial use as forage or pasture land soil for incalculable time spans." Forage and rangeland plants from uranium mine soils: long-term hazard to herbivores and livestock? by Gramss, G and Voigt, KD, in: Environmental Geochemistry and Health, ahead of print Oct 6, 2013. On Jan. 17, 2014, Wismut announced that the works for the installation of the intermediate cover have resumed. Completion is expected within three years. The Ronneburg church environmental group criticizes the current plan for the final cover of the 90 million t Culmitzsch uranium mill tailings deposit. The tailings are located in two former open pits, enlarged by earth dams, and cover 234 hectares. The tailings do not have a bottom liner and are to be reclaimed in place. Therefore, a rather impermeable cover would be desirable to limit infiltration of precipitation in order to keep seepage and its treatment as low as possible in the future. The current plan, however, is to use locally available waste rock for the cover, with a permeability 13-fold higher than an earth cover, needlessly increasing the infiltration problem and the demand for water treatment in the long term. The group also criticizes the planning process, which is conducted according to mining law without environmental assessment and opportunity for public involvement. On June 25, 2012, Wismut GmbH announced that the works to install an intermediate cover on top of the Culmitzsch A uranium mill tailings deposit have resumed. The works had to be halted in 2010 after heavy rains had increased the surface area covered by ponding water from 3 to 40 hectares. Completion of the works is expected within three years. The Culmitzsch A deposit with a tailings height of up to 72 metres is the last tailings deposit still without an intermediate cover in Wismut's federal reclamation programme. On Oct. 6, 2011, Wismut announced the completion of the capacity increase of the water treatment plant. The garden festival was opened on April 27, 2007, and will last until Oct. 14, 2007. The church environmental group of Ronneburg (Kirchlicher Umweltkreis Ronneburg) criticizes some aspects of the reclamation currently being performed by Wismut GmbH in the former uranium mining area of Thuringia. The group raises concerns related to the flooding of the former underground mines, and related to the top cover to be applied to the Lichtenberg waste rock pile. The Thuringian underground mines with approx. one thousand kilometers of tunnels are currently in the process of being refilled with groundwater. During the active mining period, groundwater had been pumped, producing a huge depression cone. Now, the pumps have been shut off, allowing inflowing groundwater to refill the mine. According to the group, the procedure chosen for the refilling of the mines allows for higher contaminant levels in any outcropping water than achievable with a more modest refilling scheme that would require more expenses for water treatment, though. On June 5, 2004, Wismut GmbH will start the pull down of the four conical landmark uranium waste rock piles in the Ronneburg area (Thuringia). The piles are approx. 100 meters high and contain a total of 15 million cubic meters of waste rock from the former underground mines in the area. The material will be relocated to the former Lichtenberg open pit mine in Ronneburg. In the Federal States of Saxony, Saxony-Anhalt and Thuringia, centuries of mining and milling activities resulted in numerous residues with increased levels of natural radioactivity, like waste rock dumps and tailings ponds. These may have altered the situation concerning radiation exposure significantly. Especially waste rock dumps from old mining activities as well as 20th century uranium mining may, due to their radon exhalation capacity, lead to significant radiation exposures. They often lie close to or within residential areas. To investigate the impact on the natural radon level, the federal office for radiation protection has run networks of radon measurement points in 16 former mining areas, together with 2 networks in regions not influenced by mining for comparison purposes. Altogether, data has been taken at 595 measurement points. As a result of these investigations, representative overviews of the long-term outdoor radon concentrations could be established including estimates of regional background concentrations. One of the most important findings of the investigations is the fact that the former mining and milling activities did not result in large area impacts on the outdoor radon level. Only some of the neighbourhoods immediately adjacent to mining residues show a significant increase of concentration, which might also influence the indoor concentrations in nearby houses. Based on the background values, regions were identified where the radon exhalation from mining residues has lead to increased concentrations in residential areas and resulting radiation exposures of the population estimated. Also, the consequences of the Wismut companies reclamation activities are reported. Finally, recommendations are given on the radiological evaluation of outdoor radon concentrations." On Sep. 23, 2015, Wismut GmbH announced that the partial reclamation of the Freital No. 4 tailings pond in Saxony started on Sep. 22, 2015. This pond received uranium mill tailings from Jan. 1958 to Dec. 1960, and it has since not been cleaned up. Large parts of the deposit are covered with water. The (unspecified) cleanup work is to be performed by contractor Heitkamp and is estimated to last 5 years. The agreement was signed on April 24, 2013 (Freie Presse Apr. 24, 2013). The reclamation of the legacy uranium mill and tailings site site in Dresden-Coschütz has now been completed: The two uranium mill tailings piles located next to the site in the valley of Kaitzbach creek have been reclaimed in place. The piles contain a total of 2.5 million cubic metres of uranium mill tailings, plus 2.28 million cubic metres of ashes and other wastes. The cleanup of the 72 hectare former mill site had already been completed in 2003; the site was then developed into an industrial estate. The cleanup that started in 1993 caused costs of Euro 45.5 million, 14 million of which were contributed by the city of Dresden, and the rest by the state of Saxony and the Federal Republic. The monitoring of the site during the next 25 years will cost another Euro 3.5 million. While in Saxony efforts for the reclamation of Wismut's abandoned legacy sites (i.e. sites that are not part of the federal cleanup programme) are ongoing for some years already, the Thuringian Ministry of Environment sees no need to set up a similar effort for those of Wismut's legacy sites that are located in Thuringia. These sites are not even secured against release for new uses, in spite of the persisting hazards. High uranium concentrations of up to 3.5 milligrams per litre were found in the water of the village pond and some private ponds in the village of Gauern in Eastern Thuringia. The village is located close to the 80 million t Culmitzsch uranium mill tailings pile and the Gauern uranium waste rock pile. For comparison: the World Health Organization WHO recommends a value of 0.002 milligrams per litre for drinking water, and the U.S. drinking water standard is 0.03 milligrams per litre. Fish caught from the village pond also had elevated radionuclide concentrations: more than 10 Bq uranium, 5 Bq Pb-210, and 0.3 Bq Ra-226 per kg. The uranium concentration exceeds normal concentrations 500-fold, the Pb-210 concentration 20-fold.